There's no denying that the new Mac Pro from Apple is quite the looker. The cylindrical shape is certainly unique and there are a lot of things to like about it. 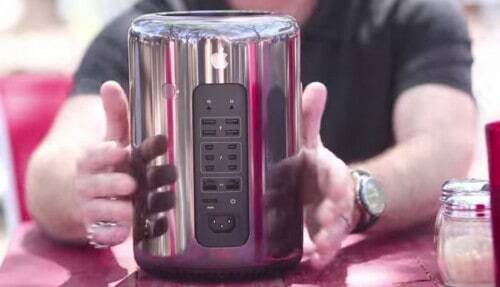 However, as a video from the folks at Boxx reveal, the Mac Pro may not be all it's cut out to be. Yes, they're taking some pot shots at what is missing from the Mac Pro. In the video, they point out that you can't really upgrade anything unless you're going through Thunderbolt, but we found out earlier this year that some stuff can get upgraded on Apple's machine. The guy in the cowboy hat points out the lack of dual Xeon processors, for example, and how you can't install another hard drive either. Meanwhile, the happy new Mac Pro owner starts to look a little less happy as the video progresses. Of course, if you really want to have more flexibility and potentially more power down the line, you're probably better off building your own PC instead anyhow. What do you think? This video is meant to be funny, of course, but do you think it's being fair to the trash can-shaped machine?